Karma said she wants to be part of the solution to problem of homelessness in cats, so she told me to come up with an idea that would get humans to give donations for spay and neuter surgeries for local kitties. I told her humans like to do nice things for their pets at the same time they are helping kitties they don’t know. 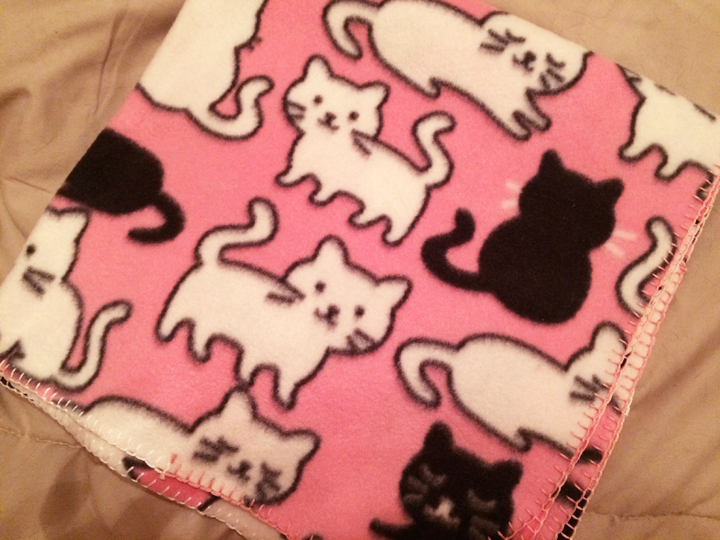 Kitties love fleece, Karma said. Buy some fleece, and we’ll figure it out. I did as she said. She tested piles and piles of fleece while I tried different designs for clothes for pets and people, beds, and blankets. The fleece lounging pants were so ugly that I’m not even going to post the picture! 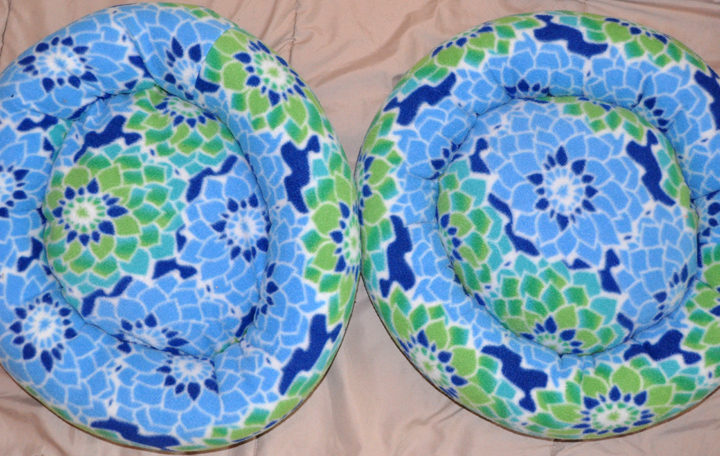 We settled on round and rectangular pillows, doughnut-style beds and blankets. 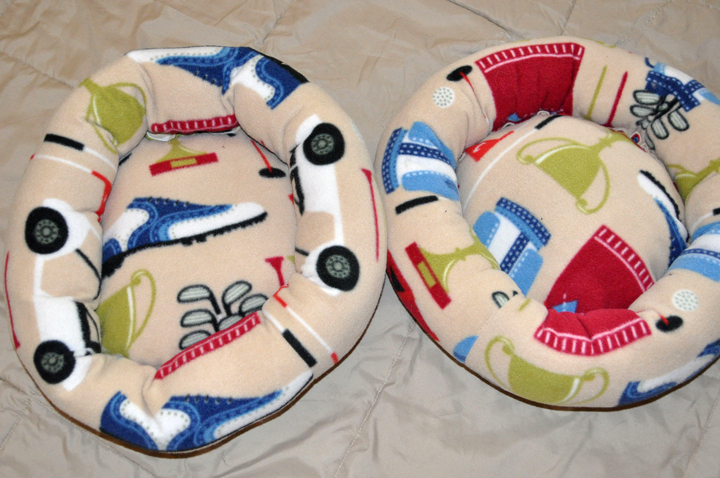 Karma’s Project, then, is for me to make fleece pet beds and blankets and give them to people who make donations for ARF – Animal Rescue Foundation to help kitties get spayed or neutered. ARF helps a lot of kitties in our area, and we want to help them do more. Seguin has a large cat population, like most North American towns. A lot of the cats have people who take responsibility for their cats’ rate of reproduction by getting our own and free-roaming cats no one claims spayed or neutered. Some of our citizens would like to help manage local feline fertility (for both pet cats and community cats), but they just can’t afford the cost of spay or neuter surgery. It’s hard for those people to get help with spay or neuter of their cats. Some local vets help out, the Humane Society has a low-cost spay/neuter clinic one day per week, and ARF helps out as much as they can, but it’s just not enough for everyone who needs help. Karma’s Project is small now, but I hope it will grow into a sustainable fund to provide grants for local people who need help to get the cats they care for neutered or spayed. A donation of $40 pays for neutering at our local Humane Society. A $50 donation gets one potential mama kitty spayed, and we all know what that means in terms of controlling the growth of population! My students at Texas Lutheran University stuffed most of the beds in an activity course I taught about animal rescue in July. One student made a donation right there in class and took the bed she stuffed home for her dog! 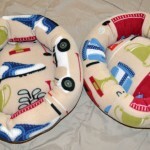 Cheddar has now inspected the merchandise and said we are ready to go public with the round pillows and the doughnuts! We also have one blanket. 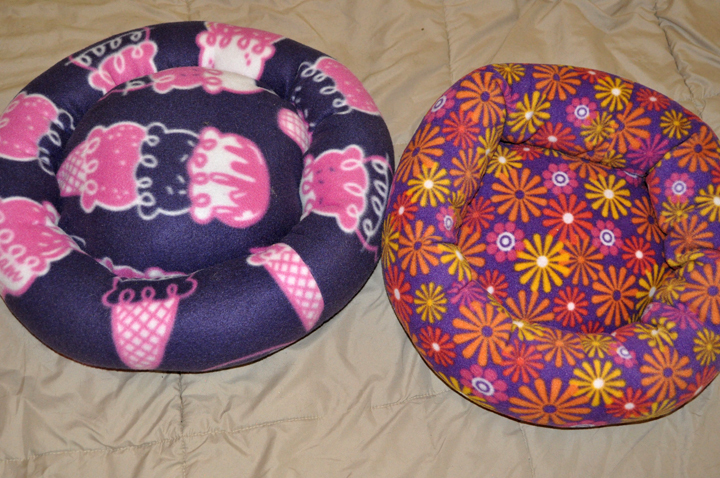 The round pillows are 13″ in diameter, great for kitties and small dogs. Right now we have three of those finished. Nutmeg especially loves hers (she lets Becket sit on it but only every so often). These beds would also make great pillows for large dogs to rest their heads on. 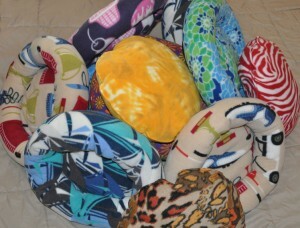 If you aren’t excited about these colors, we can discuss the other fabrics we have and make a custom bed for your pets. 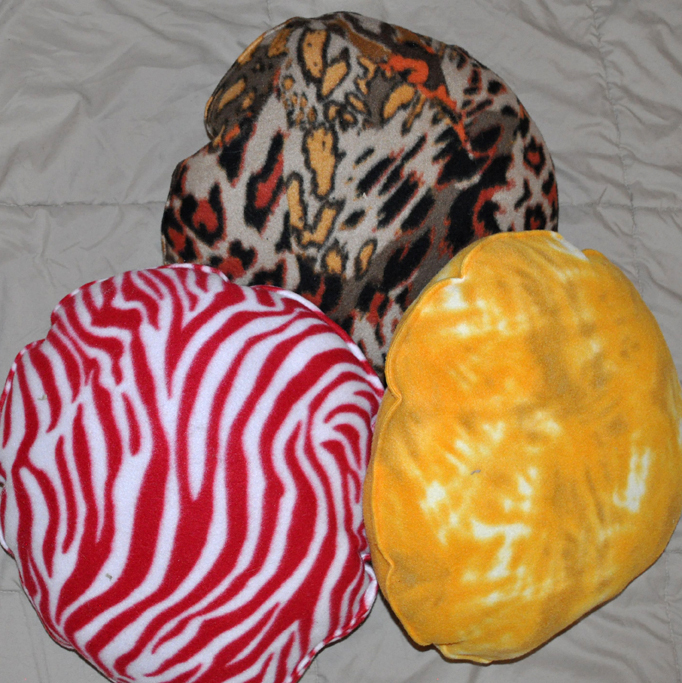 We can also add a heat reflective layer in the round pillows. This is good for older pets who don’t like the cold. 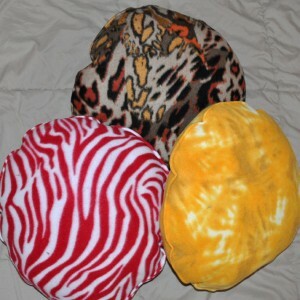 We are asking for a minimum donation of $25 for the round pillow premium. Giving a minimum donation of $25 for Karma’s Project gets you a choice of a round bed or a cat blanket. 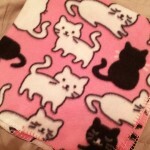 The blankets are 27″ x 27″ and edged in blanket stitch. 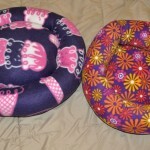 At the moment there are eight doughnut-style beds available. At 16″ diameter (inside the doughnut! 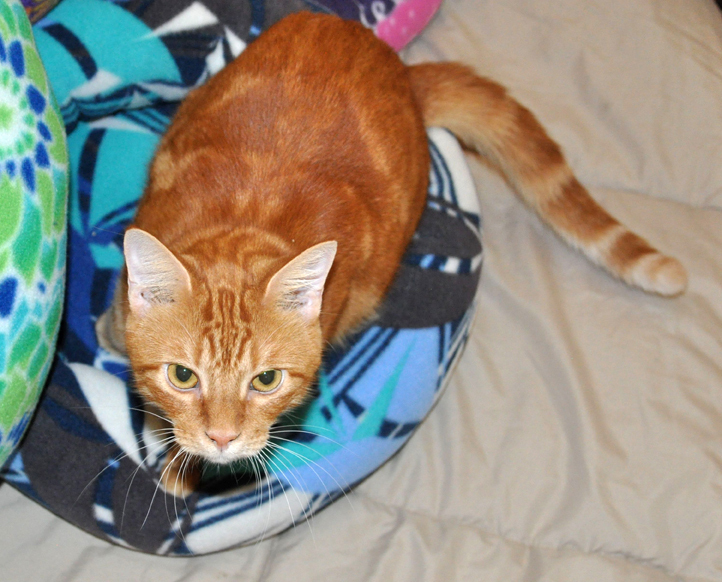 ), these beds are big enough for kitties of all sizes and small dogs (Becket fits snugly, and he weighs more than 20 pounds!). 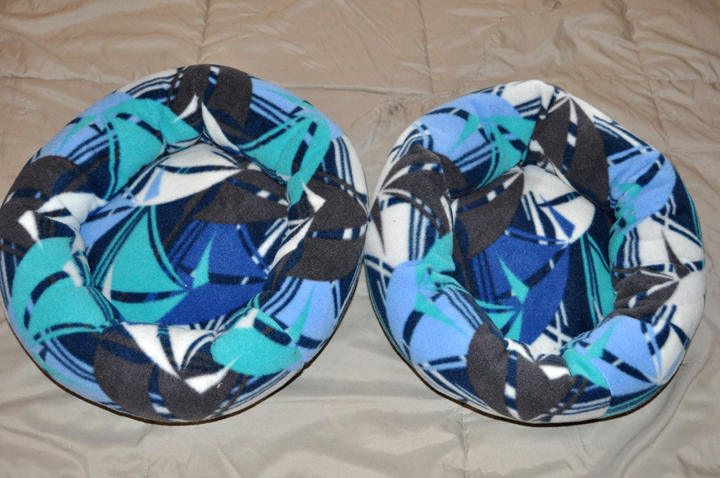 Like with the round pillows, we have more fleece if you’d like to discuss a custom style for your pet. 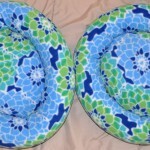 We can also add a heat reflective layer in the doughnut beds for pets who get really cold. 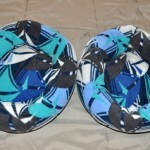 We ask for a minimum donation of $40 for the doughnut bed premium. 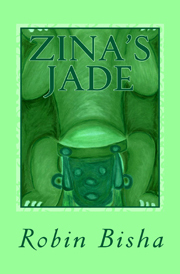 We are also asking $5 contribution toward shipping the bed(s) to you if you aren’t local. The shipping support goes to us by PayPal whether you donate directly to ARF or ask us to pass on the donation. You may make a donation directly to ARF – Animal Rescue Foundation by clicking on the organization’s name. Type “Karma’s Project” at the special notes link on PayPal, so they’ll know your donation is for cat spay/neuter. If you choose this way to give your donation, please email us the receipt when you contact us to choose your bed. We’ll give you our PayPal information then. 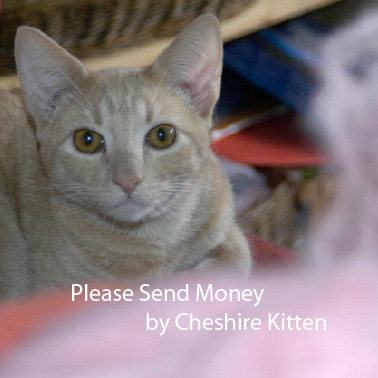 If you would prefer that we pass the donation on your behalf, you can contact us by email at cheshirekitten (at) sbcglobal (dot) net to get our PayPal information. If you need help understanding all of this send us an email, and Cheshire will explain. cheshirekitten (at) sbcglobal (dot) net. 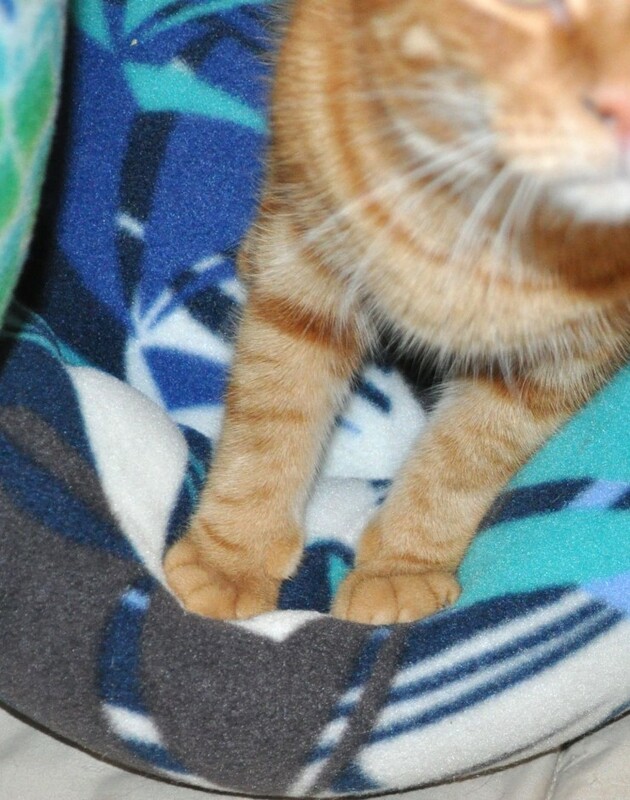 There’s nothing eco-friendly about the ingredients in the beds (fleece and stuffing are both polyester) but controlling the population of cats has a great environmental benefit. It would be so cool if you decided to help kitties avoid unwanted pregnancies. Your pets will be so proud of you! 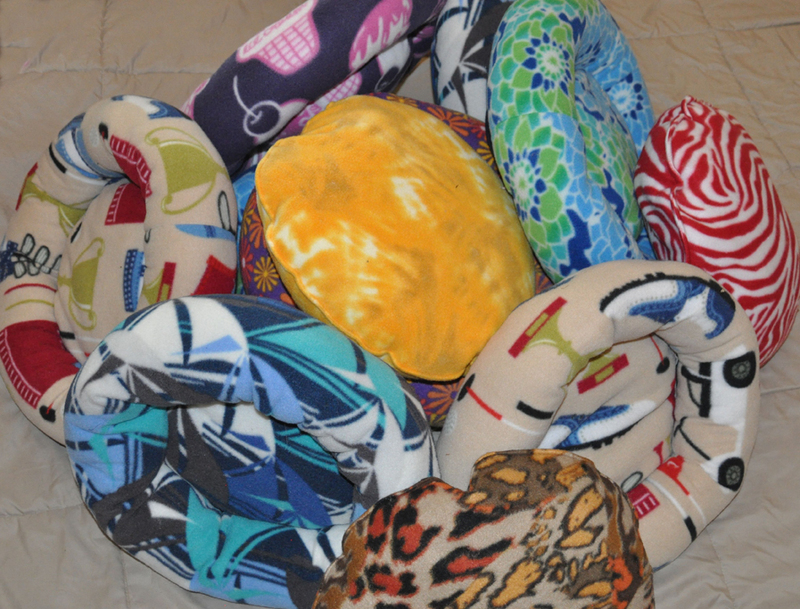 And the beds and blankets will make great Christmas gifts, even for the bossy ones like Karma! what a wonderful idea and they are beautiful!